Bright up any party with these easy, light and delicious cheesecake filled strawberries! Cut off the stems and a small part of the bottom with a sharp knife, so that your strawberries can properly stand. Remove part of the inside flesh with a melon baller or a sharp knife, depending on the size of the strawberries. Prepare the cheesecake filling.Put the ricotta and sugar in a large bowl and mix energetically with a spatula or hand blender until smooth and creamy. Transfer the filling into a piping bag and chill 5 mins in the freezer to set. Fill each strawberry with the cream. 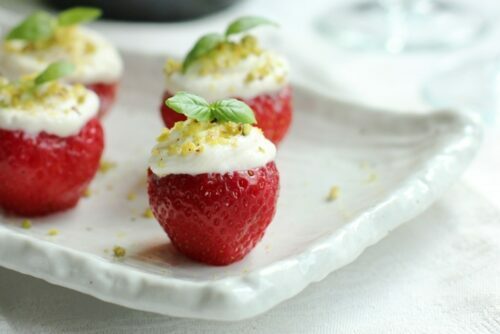 Decorate with crumbled pistachios and top with baby basil leaves. Serve immediately or refrigerate in an airtight container until ready to serve.